nine, is independent in politics, and fraternally is a member of the Modern Woodmen of America. He is still a young man, has been successful in all of his undertakings so far, and it would not be all idle prophecy to predict a very bright future before him. Mr. Anderson's recollection of his early years in Nebraska includes his uncomfortable experiences in the blizzard of January 12, 1888. He was at school, and his father coming for him, they started home. In some way a gust of wind carried his hat away in the storm beyond recovery. In his exposed condition his ears, checks, and nose were severely frozen, giving him a painful reminder of the storm for many weeks after it had passed. Their first residence on coming to Nebraska was a dug-out, which was later replaced by a frame dwelling; during the earliest years sunflower stalks at times were their only fuel. 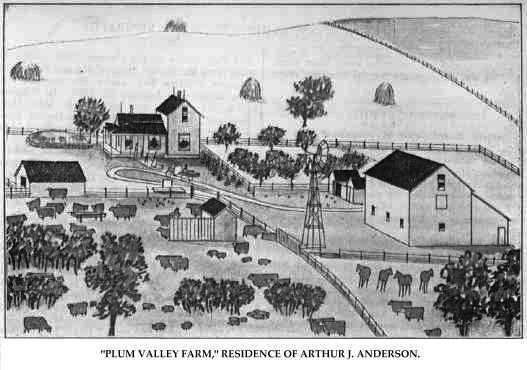 "Plum Valley Farm," Residence of Arthur J. Anderson. William Jilg an enterprising real estate dealer of Osmond, Nebraska, has seen much more of the state of Nebraska than the average citizen. He was born in the village of Oberwildgrub, Austrian Silesia, January 1, 1863. His parents, Adolph and Caroline (Patch) Jilg, were natives of the same region. The father, who was a musician of no little skill, came to the United States in 1874 and for two years toured the east, principally in Pennsylvania, as a member of the famous "Little German Band." He was a member of the band at Madison, Nebraska, until quite a recent date. Returning to Austria at the end of 1875, he remained there farming, his usual vocation, until the autumn of 1878, when he sailed from Hamburg, Germany about the middle of September, in the steamer "Gibraltar." Mr. Jilg landed in New York with two of his sons, one of whom was William, two weeks later; and on the sixth of October reached Columbus, Nebraska. The mother with her daughter and youngest son joined the father five years later. The father and the sons first rented a farm twenty miles northwest from Columbus, on Looking Glass creek. A year later they moved to Madison county, and the father has continued his residence there since. He is living retired at Madison at the age of seventy-three years, and his wife, six years older, is still in good health, giving promise of many years more of life. William Jilg worked for his father until fourteen years of age, when he began learning the cabinet-maker's trade. He later began for himself, working out as a farm hand until his marriage in 1885. Renting for a few years in Madison county, he bought a quarter section northwest of Madison, built a house, and until 1891 was cultivating his own land. That year he sold his stock of implements, rented the land and moved in to the town of Madison, and was in the implement business there from 1891 to 1893, inclusive. He was otherwise engaged there through 1894, and the year following lived on his farm. Returning to Madison he resided there until the spring of 1899 when he leased his mother's ranch in Rock county, twelve miles south of Newport, and lived there two years. He next occupied the Doolittle ranch south of Atkinson, in Holt county, three years; then purchased a quarter section seven miles northwest of O'Neill, later adding a half section to his possession. Three years later he traded the half section for a store building and stock of groceries in Osmond, where he was in business for a time. Returning to his quarter section in Holt county, he resided there until, December 19, 1909, when he sold and came to Osmond and resolved to remain here the rest of his life, having roamed around over the west a number of years. Two seasons he traveled as an expert for the Champion Reaper Company and one season for the McCormack Company, and in this way visited all sections of Nebraska. On returning to Osmond the last time he engaged in the real estate business until 1910, when he became local representative of the Kirchbraun & Sons Creamery Company. Mr. Jilg was married in Madison, Nebraska, April 7, 1885, to Miss Mary Fresch, a native of Bavaria, whence her parents, Joseph and Catherine (Geip) Fresch, migrated to America in 1873, and settled in Madison county, Nebraska. To Mr. and Mrs. Jilg eight children were born, one child dying in infancy. Those living are named as follows: William J., who is in the dray business in Osmond; Edward a farmer; John, in charge of the Kirchbraun Company at Pierce; Ida, Adolph, Leo and Nora. Mr. Jilg is a republican, and a member of the Catholic church. Mr. Jilg reached Nebraska in time to see the last flights of the grasshoppers while engaged farm work in Polk county. His father-in-law, who, was in the state some years earlier, lost his crops several seasons by the pests. During the early years of his housekeeping Mr. Jilg burned hay, corn, and "prairie chips" for fuel. They were on one occasion in the the path of a severe hailstorm that broke every window in the house and bent in some of the sash and window casing. Western storms can at times be incredibly severe. His crops were damaged three years by hail. county, Nebraska, in May, 1878, where he worked for James McCracken and other farmers for six months, and in the year 1879 he took up a tree claim of one hundred twenty acres. On October 25, 1879, Mr. Ward was married to Miss Flora McCracken, in St. Paul, Nebraska. The McCracken family came to St. Paul in 1872. One brother lives in St. Paul, one on a Howard county farm, and a sister, Mrs. Henry Roe, resides in St. Paul. Mrs. Ward's parents are deceased and the rest of the family are scattered. They were one of the very first families to settle in Howard county. Mr. and Mrs. Ward lived on the north-west quarter of section fourteen, township fifteen, range eleven, for seven years, then moved to Colorado and engaged in ranching remaining eleven years. In the spring of 1898 they returned to Howard and purchased the old E. L. Peck, farm on the North Loup river bottom, on section eighteen, township fourteen, range ten, where they now own two hundred acres of choice land, a good house, and well-equipped farm. They also own a town residence in St. Paul, Nebraska, and expect to make that place their home in the near future. Mr. Ward is owner of the hardware business of that name in St. Paul, of which his son, William R. Ward, is manager. Mr. and Mrs. Ward have seven children four boys and three girls - a family of education and good attainments: Walter I., who is married and lives on a Howard county farm; Almeda, married to Charles H. Kelley, is living in Alberta, Canada; Mamie A., married to Otto A. Peterson, lives in South Dakota; William R., manager of the Ward Hardware Company, St. Paul; Oliver Leslie, college student; and Harry R., and Effie M. who reside under the parental roof. Mr. and Mrs. Ward are widely known and have many friends and acquaintances in Howard county. Mr. Ward is a self-made man, and his life demonstrates what may be accomplished by industry, good management and honest dealings. He is a man of intelligence and capability and has acquired an enviable reputation both socially and in a business way. The above named gentleman is one of the old settlers in this part of the state of Nebraska, and has been closely identified with the development and growth of this locality, aiding materially in the upbuilding of the community in which he chose his home. Mr. Wigent resides on section four, township nineteen, range thirteen, where he has a fine grain and stock farm of one hundred and sixty acres. Charlie D. Wigent was born in Berrien county, Michigan, August 7, 1861, and was the youngest of six children in the family of John and Rachel (Mink) Wigent, who had four sons and two daughters. The Wigent family came to Valley county, Nebraska, in 1877, the father being one of the original homesteaders of Valley county. Mr. Wigent, subject of this sketch, took a pre-emption claim of one hundred and sixty acres on Turtle Creek, Valley county, in 1882. In 1894, the dry year in Nebraska, Mr. Wigent, having heard the claims made by residents of Missouri and Minnesota, took his team and wagon and made a flying trip to look at the country, but soon returned to Valley county, saying that Valley county was good enough for him. Mr. Wigent's brother David and himself, and a nephew, Lysle Craig, who lives on Davis creek, are the only ones of the family living in Valley county. Mr. Wigent was married to Miss Annie Kasel, December 1, 1894, in Ord, Nebraska, soon after his return from Dakota, satisfied to marry and settle down in Valley county. Mrs. Wigent is a daughter of James and Mary Kasel. Mr. and Mrs. Wigent have had eight children, seven of whom are living: Fredrick, Ernest, Pearl, Rachel, Ralph, deceased, Edith, Blanche, and an infant, Merilla. Mr. and Mrs. Wigent and family have many friends, and are among the leading old families of Valley county. Among the prominent old settlers of eastern Nebraska, we mention the name of Al. Dover as being one of the best known from the fact that he has spent all but six years of his life in this region, and during that time he and his father have devoted their best efforts to aiding in the development of the natural resources of Madison county, helping to build up the community in which they chose their home. Our subject now resides on section four, township twenty-two, range one, which has remained the home place since the family came to Madison county. Mr. Dover is a native of Wales, his birth occuring November 26, 1865, and he is a son of James and Jane (Nicholson) Dover. In 1854, Mr. Dover's father came to America, settling in Massachusetts, there remained three years and worked at his trade, which was that of Morocco leather dresser, which trade he had learned in Wales. He returned to Wales and later came back to America with his family, sailing from Liverpool to New York. After reaching American soil, Mr. Dover started for the west, locating in Delaware county, Iowa, where he remained eight years; be then brought his family to Madison county, Nebraska, coming by the prairie schooner route. seventies, among other disasters, the destruction of all the crops by grasshoppers during the first few years in Nebraska. Columbus and Wisner several miles distant were the nearest market places then. In 1889 Mr. Dover our subject, was united in marriage to Miss Nattie Twing, and Mr. and Mrs. Dover are the parents of one child, a daughter, Edna. Mr. Dover is a highly and respected citizen of his community, and owns eighty acres of good land, six acres of which is cultivated to trees. Moses F. Smith, one of the pioneer settlers of Custer county, Nebraska, owns over one thousand acres of Nebraska land - three hundred and twenty acres of this within the county - after selling six hundred and eighty acres in 1911; he is known as one of its most successful men in this section. He was born near Hebron in Pleasants county, West Virginia, April 18, 1862, next to the oldest child of Jacob and Eliza (Cornell) Smith, who had six sons. The parents were natives of West Virginia also, where the mother died in the spring of 1876 and the father still lives on the old home farm. Four of their children are living: Moses F.; Arthur P., an attorney at law, at Weleetka, Oklahoma, lived for a time in Custer county; Okey J., on the old home place with his father; Oscar M., owns a farm near the old homestead. The first-named is the only one of his immediate family to locate permanently in Nebraska. In 1884 Mr. Smith left home and went to Danville, Indiana, to attend college, having received his early education in the public schools. In June, 1884, he came west by rail to Kearney, Nebraska. He proceeded from Kearney with a team into Custer county and pre-empted the southeast quarter of section twenty-six, township nineteen, range twenty-two, in February, 1885, and this has continuously been his home since that time. He has added to his holdings from time to time and is a successful and prosperous man of quiet force and energy in the conduct of his affairs. Besides his property in Custer county, he owns over eight hundred acres of land near Ogallala, Keith county. He is well known throughout the region where he has spent so many years and is a member of the Independent Order of Odd Fellows and the Ancient Order of United Workmen. He is a communicant of the United Brethren church. On September 23, 1886, Mr. Smith married Miss Sarah A. Pierpont, daughter of William and Elizabeth (Wells) Pierpont, a native of West Virginia, whence her parents came to Custer county in 1878, and were original homesteaders. Mrs. Smith is the tenth of the eleven children born to her parents and has one brother and two sisters living in Nebraska: Orlando, of Minatare, Scottsbluff county, Nebraska; Jane, now Mrs. C. D. Smith, of Merna;. Emma, now Mrs. R. R. Robinson; of Custer county. Mr. Smith and his wife are both much interested in the welfare and upbuilding of their county, in which they have been active, and both are among the pioneer settlers there. Mr Smith has held various township offices in years past. They have had four children, namely: Ansley, at home; Opal, wife of Roy Stanford, living one mile north of Merna; Ethel, wife of John D. Bowley, living one mile south of New Helena, has two children, Loretta and Florence; Mabel Rita, at home. All were born on the home farm. The family experienced all the deprivations of the early days of development. During the dry year, 1894, they raised nothing in the fields but had a fine garden, owing to irrigation. The drouth of that year caused them another hardship; one after another three children were taken down with typhoid and finally the mother succumbed after nursing her little ones. During the latter part of their infliction Mr. Smith sat up to attend them until four o'clock after teaching school all day. This vocation, although the salary was small as compared to the present day, tided them over the year of drouth. In girlhood and during married life, Mrs. Smith has lived for thirty years, in sod houses. In 1912 they built a fine modern dwelling on a farm adjoining the one which they had lived many years and which was sold in 1911. When her father first settled in the west Mrs. Smith saw deer and antelope in herds like sheep. Buffalo bones and deer's horns lay thick on the prairies while buffalo wallows were thick in the valleys. William Flint, a prosperous agriculturist and business man of Cotesfield, Howard county, is a well-known pioneer of that region. His pleasant home is located on section nineteen, township sixteen, range eleven, comprising eighty acres of tilled land with good buildings and improvements of all kinds. region his home continuously for the past twenty-six years. His home farm is fully equipped for stock and grain raising, and he is among the prominent and successful men of his locality. Mr. Flint was married in Cotesfield, October 20, 1897, to Miss Fidelia Parker, who was the youngest child in the family of John M. and Elizabeth Parker, old settlers in Howard county. Mr. and Mrs. Flint have two children, Alta Elizabeth and Elsie Blanch, who are bright and charming young misses. For several years prior to her marriage, Mrs. Flint was a teacher in the Howard county schools, and has a host of friends, both herself and husband being prominent socially. Jonas S. Roth is a pioneer homesteader of Custer county and one who has been largely successful as a farmer and stockman. He has a fine farm, well equipped for stock and small grain, with a large, comfortable home and good outbuildings, surrounded by a fine grove of trees which he set out himself. He also has a fine growth of natural timber which grew along Dry or Wagner creek. Mr. Roth was born near Circleville, Pickaway county, Ohio, September 23, 1850, eighth in order of birth of the children of Thomas and Esther (Griest) Roth, who had nine sons and four daughters. He has six brothers and three sisters now surviving, none of whom, however, live in Nebraska. The rather was a farmer and removed with his family to Edgar county, Illinois, in 1857. He first rented a farm there and later purchased land of his own. Mr. Roth lived on the home farm in Edgar county with his parents until his marriage, being the last son to leave home. On December 1, 1874, he married Virginia Eubank, whose family is described in connection with the sketch of I. D. Eubank, which appears in this work. The young couple located on a farm in Edgar county, where they lived until the fall of 1879. They then left with their three sons for Custer county, making the trip via the prairie schooner route and reaching their destination in November. They moved into the Jim Oxford cedar log house which stood on the West bank of the middle Loup river, near the present Comstock bridge, where they spent the winter. Mrs. Roth's brother, Richard Eubank, came with his wife at the same time, the two families coming with covered wagons. In May of the next year Mr. Roth entered his homestead of one hundred and sixty acres of land on section twelve, township eighteen, range eighteen, erecting his house on the southeast quarter of. the northwest quarter, and also took a tree claim in section twelve of that town. He still owns and occupies the original homestead and tree claim and has three hundred and sixty acres of land in the home place, having acquired forty acres of the section by purchase. He had had continuous residence on the farm except for five years, from 1891 to 1896, which he spent in Saline county, Missouri. He has been connected with the passing events of the neighborhood, and although of a quiet disposition, has always done his part along educational and other progressive lines. Mr. and Mrs. Roth have eight children: Clifford, married and living in Comstock, has two children; Edgar, married and living on a farm two miles east of the home place, has three children; William, married and living four miles north of Comstock, has two children; Dora, wife of Pearl Walton, of Graham county, Kansas, has two children; Mary, wife of Charles Mattox, lives on a farm adjoining the home place and has two children; Nellie, wife of Earl Anderson, lives on the home farm; Halley, wife of Lloyd Bennett, of Dry Valley, has one child; and Fred, at home. Herman Groeling, a prominent farmer and stockman living on section twenty-five, township thirty, range eight, is well known throughout Knox county as a progressive and successful agriculturist, highly esteemed by all with whom he has to do. Mr. Groeling owns the Walnut Merchandise store, and is also postmaster at that place, having held the office for twenty-seven years. Mr. Groeling is a native of Germany, having been born in Pommerania Province in 1848, and is the son of Christ and Juliana (Schmidt) Groeling. His father was a school teacher, as were his ancestors as far back as our subject knows. In 1853 Mr. Groeling, with his parents, left Germany for America, embarking on a sailboat at Hamburg for New York, they having heard the glowing accounts of the opportunities afforded in the New World to get land for almost nothing, and a better chance to make a start in life. After landing in the United States, they proceeded to the state of Wisconsin where they settled and remained four years; and from thence going to Burlington, Iowa, living there eleven years. They moved then to Page county, Iowa, residing there four years. Our subject drove to Nebraska in 1871 where he took up one hundred and sixty acres of land a pre-emption claim, close to Winnetoon, and there built a log house. the destructive blizzard of 1888 did its share in creating havoc in that section, Mr. Grueling losing some cattle; and in 1894 the crops were again a failure. Deer and antelope were plentiful when our subject first came to Nebraska, and could frequently be seen grazing on the prairies. Mr. Grueling now owns twenty-two hundred acres of good land, situated on the Verdigris creek, which affords a good supply of water. The ranch is well improved with good buildings and a fine residence, and Mr. Grueling has a fine orchard and grove. Mr. Grueling is of the opinion that the average man here is much better off financially than in Iowa, is the land here is cheaper and crops grow just as well with less attention, one man taking care of one hundred acres here as easily as he could fifty acres in Iowa. Mr. and Mrs. Groeling are the parents of eight children, namely: Anna, now the wife of Mr. J. F. Butterfield; Myrtle, wife of L. D. Forney; Lydia, Gusta, now Mrs. Tikalsky; Hilda; Lewis; Bethold, who is married to Miss Josephine Mott; and Herman. Mr. and Mrs. Grueling and family are one of the most respected and highly esteemed families of their community, and enjoy the friendship of a wide circle of friends and acquaintances. James P. Porter is widely known as a pioneer of Nebraska and one of the few original homesteaders in his neighborhood. He has passed through the years of hardship and privation, drouth and grasshoppers, and the trials of life on the frontier, having won a good reputation and standing in his part of the county and reached a period of prosperity and success. Mr. Porter was born in Efflingham county, Illinois, October 18, 1847, the seventh born child of the six sons and four daughters of James and Mary (Parkhurst) Porter. One son, George Porter, came to Custer county in 1899 and lives near Mullen. The parents are deceased and the only members of the family who now survive are four sons. Mr. Porter was educated in his native county, reared to farm work, and lived in Effingham county until the fall of 1882. He was there married March 8, 1865, to Mary A. Parkhurst. In September, 1882, Mr. Porter brought a team and covered wagon to Custer county, being accompanied by two children. His wife and one child came by train to Grand Island and thence the family came together to the homestead on the northeast quarter of section thirty, township eighteen, range nineteen, making the trip with a wagon. This homestead has since been the home place and has been developed to a fine state of productiveness. Mrs. Porter's mother, two brothers and two sisters, were residents of Nebraska prior to 1882, and one brother, David, and a sister, Phoebe, now live in Omaha. Mr. and Mrs. Porter have seven children who survive: William F., married and living near Arnold, has five children; Laura, wife of C. W. Galpin, of Broken Bow, has two children; Calvin O. married and living near Berwyn, has two children; Samuel A., born in Custer county, is married and lives at Lincoln; Charles W., the youngest child, born in Custer county, is at home, Alma and Elma, twins, born in Custer county. Alma is the wife of Percy Carland, living near Berwyn, and they have one child; Elma is the wife of Jule Smets and they live near her parents. The family have always stood for the best interests of their county and state and have shown themselves the friends of progress in various forms. They have a wide circle of friends and are prominent in many circles. A. E. Derry, a prominent farmer and oId settler of Antelope county, Nebraska, resides on his fine farm in section eleven, township twenty-three range six. He is the owner of two hundred and forty acres of good land, which he has accumulated by dint of his honest industry and persistent labor, supplemented by good management and integrity. Mr. Derry is a native born Nebraskan, his birth occurring April 28, 1859. His father, George Derry, is a typical pioneer of Nebraska his settlement in the state dating from 1857, settling in Dodge county. He came here from England, of which country he is a native, having been born in London, (Lanchestershire) in 1823. He grew to manhood in his native land and followed the occupation of bridle maker. He is now living in Decatur county, Iowa, where he is well-known and highly esteemed and respected. Our subject's mother, Louisa (Weldon) Derry, was also born in England, her birth occurring in the year of 1821, Mr. George Derry, our subject's father, in 1857, left his native land and came to America where he could get land cheaper and where there were more opportunities for a man to support a family; he settled in Dodge county, Nebraska, where he took up a pre-emption and homestead claim, and built a log house, the roof being made of cornstalks. Here the family went through about every hardship and danger it was possible to encounter, suffering losses through every conceivable cause; this is not to be wondered at, as at that time this section of the country was almost unknown as a habitation for a white man; they had many scares from the red skins which then inhabited the western country; grasshoppers made their visit to Nebraska in 1873-74-75; the blizzards of 1869 and 1873 did a great deal of damage to those early settlers in that part of the state. 1886, Mr. Derry was married to Miss Melvina Black, and Mr. and Mrs. Derry are the parents of four children, named as the following: Zaida E., George W., Sanford M., and Melvin A.
Mr. Derry during his long residence in this section has become well-known as a man of integrity, and has always done his full share for the betterment of conditions in his locality; he was elected by his constituents to the office of county commissioner, which office he satisfactorily filled for three years, taking oath in the year of 1900. At the present time he is town clerk and has always taken a commendable interest in public affairs. James H. Kerr and his estimable wife are prominent in social, educational and religious circles in Custer county, and are highly regarded as being identified with the best interests of the region where both have spent so large a part of their lives. Mr. Kerr is a native of Winnebago county, Illinois, born September 18, 1855, the ninth of the twelve children of Charles and Anna (Larkin) Kerr, and one of four sons. The father was a native of Aberdeenshire, Scotland, and the mother of Somersetshire, England, and they were married in Canada, coming to the United States about 1834. They came across the lakes on the boat "Erie" on her last trip, just prior to her burning on the return trip to Canada. They were pioneers of Illinois and all their children were born in the United States. The father died in Roscoe, Illiois, in 1872, the mother having passed away some time prior. Mr. Kerr lived in Winnebago county until his eighteenth year, and received his education in the public schools. He then moved to Cook county, in the same state, which was then the home of his guardian, and when he attained his majority started out in life on his own account. He was married at Blue Island, Illinois, March 13, 1879, to Miss Alice Ursula Lewis, daughter of Thomas and Margaret E. (Jones) Lewis, pioneers of Illinois. Thomas Lewis was a native of Swansea, Wales, and came to America with his father and family in 1839, and married Margaret Jones in 1850. Both Mr. Kerr and his wife are the only members of their respective families who are living in Nebraska. Mr. and Mrs. Kerr began housekeeping on a farm in Cook county, Mr. Kerr having been reared to farm work, and this place, which was near the city of Chicago, was largely devoted to raising hay. In April, 1881, Mr. and Mrs. Kerr removed to O'Brien county, Iowa, and lived on a ranch there until December, 1885 when they came to Custer county. They took a pre-emption on the northeast quarter of section twenty-one, township thirteen, range eighteen, and lived there about a year, then took up a homestead comprising the northwest quarter of section seventeen, township fourteen, range eighteen, where they lived until locating in Ansley in August, 1893, and since that time have lived in Ansley. In that year they made a trip to the World's Fair in Chicago. Mr. Kerr is engaged in the grocery and hardware business in Ansley, and they have a modern home in the town. He is one of the most successful and popular merchants in the county and has done his full share in promoting the development and progress of the central part of the state. Besides his property in Ansley, Mr. Kerr still owns a farm near the town. During the trans-Mississippi exposition, Mrs. Kerr was a member of the board of the bureau of education, from the sixth congressional district. Mrs. Kerr was one of the earlier educators of Custer county and taught in the public schools of Ansley, Mason and other towns of the county. She is a woman of rare attainments and culture and is always ready to give her time and attention to all causes calculated to advance the higher development and uplifting of her town, county and state, along all lines of progress. She and her husband have a taste for good literature and have one of the finest private libraries in their part of the state. Mr. Kerr is a member of the Masonic order, which he joined several years ago. Mr. and Mrs. Kerr have had four children, three of whom are now living: Howard, born in Cook county, now living in Twin Falls, Idaho, has one child; Margaret, wife of William A. Wolford, born in O'Brien county, Iowa, living in Ansley; Alice Ursula, born in O'Brien county, Iowa, married Oscar M. Carter, lives in Cashmere, Washington, and has two children: Grace May, born in Custer county, died March 26, 1902. One of the best known men of Custer county is Dr. Robert C. Talbot, who was the first physician to locate in that part of the state. He has long been closely identified with the progress and upbuilding of the community and is a large landowner. He was born in Kentucky March 16, 1848, third of the ten children of Willis and Nancy (McCoun) Talbot, both natives of the same state. He has one brother in Sherman county, Nebraska, Dr. Nicholas Talbot, who resides in Austin. The father died in Indiana in the early eighties and the mother died there about 1899. Willis Talbot brought his family to Indiana and there Robert C. Talbot grew from infancy to young manhood. He was reared on a farm and received his education in the country schools. Later he attended college in Danville, Indiana, and then took a course in Miami Medical College, Cincinnati, Ohio, from which he graduated in 1869, after which he entered upon the practice of his profession at Sylvania, Indiana. On December 25, 1869, Mr. Talbot was united in marriage with Miss Hattie Warrick, a native of Indiana, their union taking place at Pittsboro. Her father, Edward H. Warrick, was born in Delaware and died in Indiana in 1864, and her mother, whose maiden name was Ruth Whiteman, was born in West Virginia and died in Burt county, Nebraska, in 1907. Mrs. Talbot has one brother in Indiana; one brother and two sisters in Burt county, Nebraska; one brother in Washington county, Nebraska; a sister in Boise, Idaho and a sister in Trinidad, Colorado. In the fall of 1879 Dr. Talbot brought his wife and two sons to Custer county and homesteaded on one hundred and sixty acres of land, also secured a timber claim adjoining, of the same size, and pre-empted one hundred and sixty acres, making altogether a fine grain and stock farm, which is well stocked and equipped. A few years after his arrival he was elected county treasurer and he was instrumental in organizing the school district, the first three terms of school being held in his home, pending the erection of a sod school house. About 1885 the family came to Broken Bow, where they have a pleasant home and five acres of land in the Rainer addition, and this has since been their home. Three children have been born to Dr. and Mrs. Talbot, as follows: Dr. Willis E., who is in the practice of his profession in Broken Bow, is married and has two children: Victor Claris, married and living on the family homestead, has four children: Nannie, wife of Horace F. Kennedy, of Broken Bow, has two children. Dr. Talbot has nine hundred and sixty acres of land in Custer county, as well as large interests in other Nebraska counties, and is prominent in public affairs. He and his wife have many friends and they are well-known in social circles. All the male members of the Talbot family have military records: Dr. Talbot is a civil war veteran. He enlisted in Company H, of the One Hundred and Thirty-second Indiana Volunteers, and was retired toward the end of hostilities on account of broken health. Dr. Willis E. Talbot served in the Spanish American war, in the hospital corps of the First Nebraska Infantry, in service in the Philippine Islands. He was promoted from hospital steward to second assistant, then to first assistant surgeon of the regiment and later appointed Major and surgeon of the First Regiment, Nebraska National Guard, under Colonel Talbot. Colonel V. C. Talbot served in the Spanish-American war as First Lieutenant of Company "M," he was later advanced by promotion to Captain of Company G, and on his return from the Philippine Islands campaign, was made Colonel of the First Regiment of the Nebraska National Guard. On one of the illustrated pages will be found portraits of Major W. C. Talbot, Col. V. C. Talbot and Dr. R. C. Talbot. 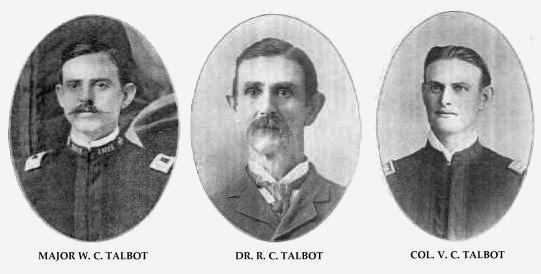 Major W. C. Talbot, Dr. R. C. Talbot & Col. V. C. Talbot. William Alexander, one of the pioneers of Pierce county, Nebraska, is a native of Scotland, born near Ayr, the chief town of Ayrshire, September 15, 1828. His parents, Robert and Margaret (Cowan) Alexander, natives of the same shire, died after a few years in Wisconsin, where they had joined their son in June, 1863. Mr. Alexander learned the carpenter's trade in his native country, where he was employed at that work until his emigration to America in the fall of 1851. Securing passage at Glasgow, he took ship at Greenoch in an old sailing vessel, and after a voyage of six weeks landed in New York; going to Philadelphia he found work at his trade and some six months later moved on to Cincinnati, Ohio, and remained there about two years. From here he migrated to Marquette county, Wisconsin, and engaged in his vocation, buying the meanwhile a tract of one hundred and twenty acres which he farmed with hired help, being employed in building most of the time. In 1873 he determined to follow the stream of settlers to the west and, selling his farm, started May 9 for Nebraska with a yoke of oxen and drove through Iowa as far as Waterloo. Here the roads became impassable, their progress being only three quarters of a mile the last day. Securing a car at the first station west of Waterloo, Mr. Alexander with his family came by rail to Sioux City, whence the roads to the west were smooth and dry. Reaching Plainview the middle of June, Mr. Alexander took a pre-emption claim one mile south of Plainview and began the life of a farmer in the west, working at his trade when there was building to be done. After a two years struggle against grasshopper pests, losing all his crops during that time, Mr. Alexander packed his family in wagons and started back to Wisconsin. On reaching La Mars, Iowa, they sojourned for a few weeks to welcome an addition to the family, Mr. Alexander securing work at his trade the while, and then proceeded on their way to the old home in the Badger state. Here they resided about four years until conditions had improved in the west, and a longing for the prairies came over them, as they had been homesick for the older state on their first advent to Nebraska.